The antennas are designed for the reception of analogue or digitally modulated MMDS programmes. They have a built-in highly selective filter on the input, therefore they are highly resistant to interference, in particular in areas with strong signals from GSM or UMTS mobile networks, or from airport radars. The "21Y" antenna is certified. IF frequency (MHz) 150...860 according L.O. L.O. leakage to IF port 60 dBµ typ. L.O. leakage to RF port 40 dBµ typ. Noise figure 2,5 dB typ. These parabolic antennas are designed for remote reception MMDS, because they have a separate antenna and a separate converter. The antenna is used as a source log-periodic broadband antenna, and reflector with three possible sizes. These antennas are designed for MMDS reception, with a medium level but are easy on space and homogeneity el-mag. field of the received signal. Antennas can also be used as broadcast. They are supplied with brackets. 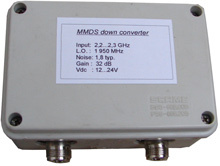 This converter is designed for use with remote or printed antennas. It have built-in a very selective filter input and is therefore very resistant to interference UMTS and airport radar. Output frequency (MHz) 150...860 according to L.O. L.O. leakage to IF port 55 dBµ typ. L.O. leakage to RF port 35 dBµ typ. Noise figure 1,8 dB typ.